Shuri just got her own ongoing series, and right off the bat, she will need to make a decision involving the Black Panther. Spoilers incoming for Shuri #1, so if you haven't read the issue yet you've been warned. Shuri is called to a meeting tradition called the Elephant's Trunk. 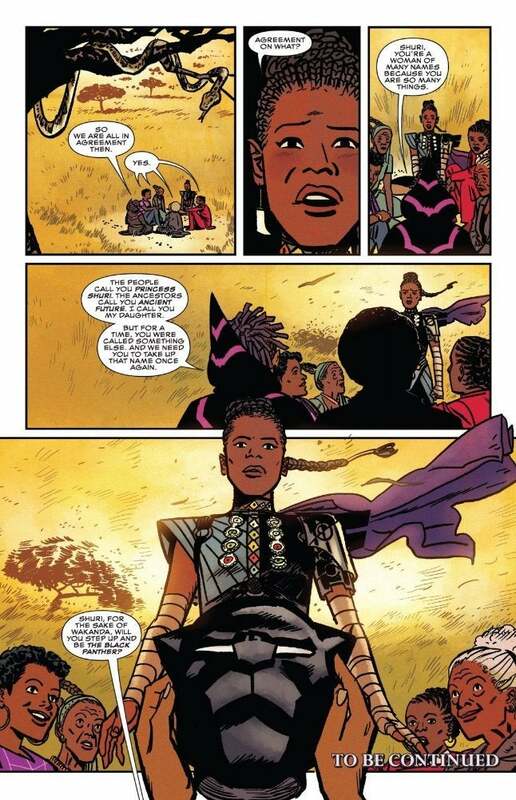 This was a secret group of women that met when Wakanda was in trouble, and Shuri's mother Queen Ramonda has called it into action once more. Thanks to Okoye gathering them the group consists of Ramonda, Zuwena (Director of the Extraction Academy), Mansa (High School Graduate from Q'Noma Valley), Tiwa (Mother of Four and Professor of Physics at Wakanda University), and Bube (Single Mother of Two, Dressmaker of Many). The group tells Shuri that this tradition is being picked up once again due to the absence of T'Challa, who has been missing for two weeks. Despite the fact that he isn't the defacto ruler of Wakanda anymore (Wakanda is a constitutional monarchy now), the country still needs a Black Panther to remain strong and not cause panic. The group is debating whether or not to tell the people of Wakanda about T'Challa's absence, as not telling the people everything is sort of how they got into his mess to begin with. They decide that they need to appear strong, and so they decide they are all in agreement. Shuri is still confused about what exactly, and they tell her that "the people call you Princess Shuri. The ancestors call you Ancient Future. I call you my daughter. But for a time you were called something else, and we need you to take up that name once again. Shuri, for the sake of Wakanda, will you step up and be the Black Panther? We'll have to wait until next month for the answer, but you can check out the spoiler images above. Shuri #1 is written by Nnedi Okorafor and drawn by Leonardo Romero with a cover by Samuel Spratt, and you can find the official description for the book below. "FOLLOWING IN THE FOOTSTEPS OF THE BLACK PANTHER! The world fell in love with her in the movie. Now, the Black Panther’s techno-genius sister launches her own adventures — written by best-selling Afrofuturist author Nnedi Okorafor and drawn by Eisner-nominated artist Leonardo Romero! The Black Panther has disappeared, lost on a mission in space. And in his absence, everyone’s looking at the next in line for the throne. But Shuri is happiest in a lab, surrounded by gadgets of her own creation. She’d rather be testing gauntlets than throwing them. But a nation without a leader is a vulnerable one — and Shuri may have to choose between Wakanda’s welfare and her own." Shuri #1 is in comic stores now.